Back cover blurb: An unexpected visitor. Dr Cat Lupo aches for another child, despite the psychosis which marked her first pregnancy. So when Ruby Winter, a small girl in need of help, arrives in the middle of the night, it seems like fate. A devastating secret. But as the events behind Ruby’s arrival emerge her mother’s death, her connection to Cat Cat questions whether her decision to help Ruby has put her own daughter at risk. Do we get the children we deserve? Cat’s research tells her there’s no such thing as evil. Her history tells her she’s paranoid. But her instincts tell her different. And as the police fight to control a sudden spate of riots raging across the capital, Cat faces a race against time of her own. Compulsive, dark and devastating, Give Me the Child is a uniquely skilful thriller with an unforgettable twist. When the doorbell rings in the middle of the night, you know that whoever is visiting you won't be bringing good news. Dr Caitlin Lupo's first thought is that it is the Police, bringing some sort of tragic news of her alcoholic father in law. Her husband, Tom beats her to the door. It is the Police, but they're not reporting news of Tom's Father. In fact they are are delivering news that will rock this happy family to the core. Tom it seems has a love child, Ruby, and her Mother is dead, leaving Ruby to turn to the Father she barely knows. Tom insists he knows nothing of Ruby. But Cat isn't sure she believes him. She is however in too much shock to question him thoroughly. Instead she thinks only of their daughter togdther, Freya, and how this will affect her. Cat is a child psychologist and also immediately sees that something about Ruby isn't quite right. Of course the poor child could be in shock after the death of her mother. But Cat's trained eye sees that there is more to it than that. She fears for the family's safety, particular Freya. Ruby is not a good influence on her daughter, but despite Tom's supposed shock at discovering his daughters exsistence, he is keen to stick up for Ruby at any given opportunity. He thinks that Cat is paranoid, delusional. After all despite her work she herself has has psychological issues, during her pregnancy with Freya. Cat knows that she isn't crazy, but Tom can be so persuasive. As Ruby integrates more and more into their daily lives, Cat becomes more fearful. The more she tries to voice these fears to her husband the more delusional he tells her she is. Cat is desperate for someone to believe her, but at what cost? 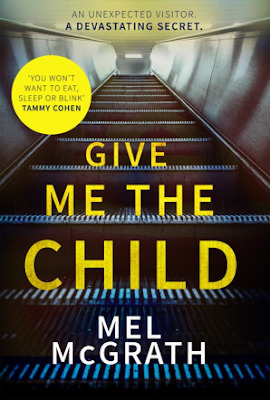 Give me the child is a gripping psychological thriller that will have you turning pages frantically trying to reach its conclusion, then wishing you hadn't been so nasty when it's all over and you wished you'd savoured it. Give Me The Child is available from 27 July 2017.